Description: Lake Griffin is the third largest lake in the Harris Chain, located in Lake County, Florida. Lake Griffin has benefited from fisheries and habitat management such as reconnecting Emeralda Marsh, installing fish attractors, bass stocking, and planting aquatic vegetation. The vegetation expansion, along with fisheries and habitat management, has resulted in Lake Griffin being one of the top bass fishing lakes on the Harris Chain. Recently, the Harris Chain of Lakes has become one of the top bass fishing destinations in the nation attracting big-name tournaments (e.g. B.A.S.S., FLW, and Bass Pro Shops: Big Bass Tour) and anglers from all over the world. Many of those tournament anglers spend the extra effort to lock into Lake Griffin and the connecting marshes. Based on results from recent electrofishing and angler surveys, the largemouth bass fishery is the best it has been in over 50 years. In fact, over the past three years anglers are experiencing excellent catch rates of 0.80 fish/hour, which is the highest ever recorded. The submersed vegetation on the north end and the recently connected marshes are popular areas to target good numbers and size of largemouth bass. Also, Lake Griffin has numerous residential canals that are popular during the spawning months. Flipping or pitching soft plastics (straight worms or creature baits) is a popular tactic to entice Lake Griffin lunkers. Also, blade jigs, swim jigs, and lipless crankbaits in and around the submerged vegetation can provide excellent fish opportunities. There are three public boat ramps on Lake Griffin: 1 – Lake Griffin State Park (3089 US highway 441/27 Fruitland Park, FL); 2 – Herlong Park (700 East North Boulevard Leesburg, FL); and 3 – the newly opened Emeralda Marsh Area 3 Boat ramp (Emeralda Marsh Road Leesburg, FL). For more information about Lake Griffin visit FWC’s Bass Top Spots. 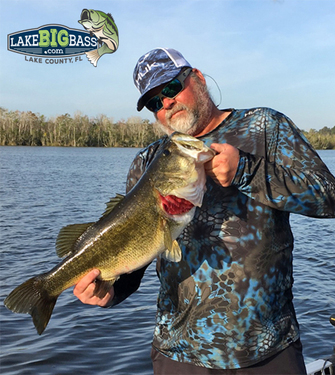 TrophyCatch partner Lake County Florida Tourism and Lake Big Bass support Florida bass conservation by providing our annual Big Bag Prize (see TrophyCatch Prizing for details).